For over forty years Moore’s Law has stood to be correct. It’s now being questioned as to whether it will continue. 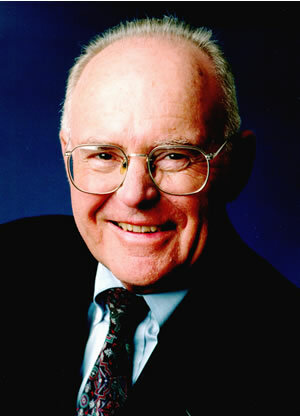 Named after co-founder of Intel, Gordon Moore (pictured), Moore’s Law stated that the number of transistors that can be placed on an integrated circuit doubles every two years. Len Jelinek, director and chief analyst, semiconductor manufacturing, for research company iSuppli, has raised the flag that given the economics of the chip business, it could well come to an end, in around 2014. Looks like Facebook and Intel are happy to tell everyone that they’re going out together – and Intel will be providing their server processors. Facebook users the world over will be breathing a sign of relief, as frankly it can be a real drag to use it, as it often runs like treacle. The runaway success of Asus’s diminutive Eee laptop and the appearance of £99 laptops like the Elonex low-cost lapster has sent manufacturers scrambling to produce their own cheap-as-chips Tiny Tim lappies. 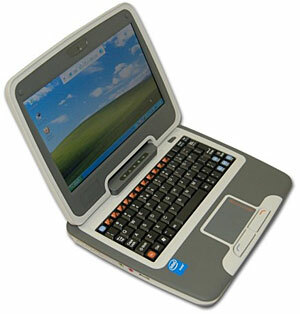 Currently motoring up over the horizon is the Intel 2go PC (formerly known as the Netbook), a rugged little number manufactured by CTL, and looking like its aimed at the education market. After a furiously frenetic flapping of flipcharts, Intel’s PR department have come up with the family name for their new range of processors destined for mobile Internet device (MIDs) and low-cost PCs. First to get the new name will be Intel’s Silverthorne chip, designed for MIDs, and Diamondville, destined for cheapo PCs such as the hugely successful Asus Eee PC. Just like clunky eight track cartridges, brick sized cellphones and desk hogging CRT monitors, the trusty hard disk could be heading for oblivion as Intel announce their first move into the flash drive market. 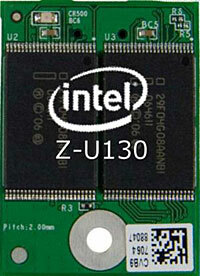 Yesterday, the electronics big boy elbowed its way onto the Flash Memory table clutching news of their Intel Z-U130 Value Solid-State Drive, offering USB 2.0/1.1 interfaces. Despite its instantly forgettable name, Intel reckons that the NAND flash memory can whip the spinning botty of hard disk drives and removable USB storage devices, offering nippier boot times, embedded code storage, faster data access, silent operation and lower power consumption. Although no one’s predicting that flash memory will replace hard disks quite yet (mechanical drives still enjoy a considerable cost advantage at large capacities), Greg Matson, product marketing manager for Intel’s NAND flash memory division reckons they could provide a more reliable and cheaper way of storing information on PCs for emerging markets. Intel is currently keeping schtum about the pricing for their Z-U130 Value Solid-State Drives (it doesn’t get any more memorable the second time around, does it?) but the capacities will vary from 1GB to 8GB, with 8GB drive not expected to emerge until the end of the year. Elsewhere, Intel were giving their Eco-Trumpets an extra long parp with the announcement of two new Quad-Core Xeon processors – the L5320 and L5310. Intel claims that these offer between a 35 and 60 percent reduction in power consumption on low-power, quad-core processors designed for high end users like data centres, blade servers and financial industries. “Intel has really responded to the industry’s call to deliver unprecedented breakthroughs for datacenter energy efficiency,” frothed Kirk Skaugen, VP of Intel Digital Enterprise Group and GM of the Server Platform Group. “IT managers can get outstanding quad-core Intel Xeon server performance today and at no premium to dual-core products,” he added. Both IBM and Intel have announced what they are calling major jumps forward in the design of microchips. They both centre on building transistors using so-called high-k metal gates, which after almost seven years of industry research in the area, it’s claimed will lead to increases in the speed and power of chips for another decade. The high-k metal gates reduce current leakage and will be used to replace the polysilicon gate electrode currently in use. It does this because the new material holds its charge longer. It is understood that Intel is further ahead in the process, with the release of computers based on the next chip types by the end of the year. A most fortunate dovetail with Vista being released, which requires a lot of horsepower to run at usable speeds. Intel said its new family of chips, code-named Penryn, will have 410 million transistors, using the new materials combined with the 45-nanometer technology manufacturing process. This compares with about 280 million in current chips. 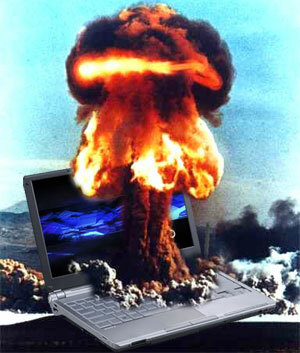 Intel also said electrical leakage will be reduced by about 30 percent. 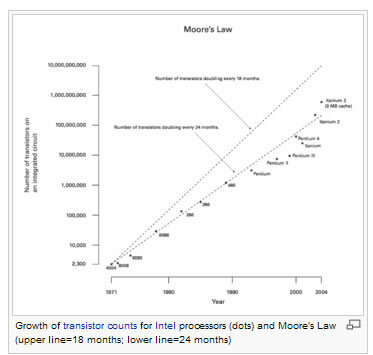 Intel are trotting out Moore’s law again (the number of transistors on an IC doubles every two years), claiming that these advantages will enable it to be maintained. Many people view this as somewhat of a marketing message by Intel, rather than a law. It’s understood that the approach of IBM and Intel differ. 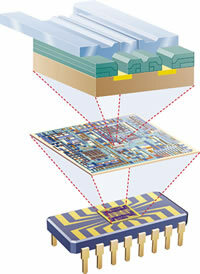 Intel are mounting the components on top of the silicon, where IBM are mounting theirs inside the silicon. IBM’s approach potentially gives them the advantage of being able to build many levels on top of each other. What the heck is a High-K material? Intel’s view of it is that “High-k” stands for high dielectric constant, a measure of how much charge a material can hold. Example of High-k materials are hafnium dioxide (HfO2), zirconium dioxide (ZrO2) and titanium dioxide (TiO2). 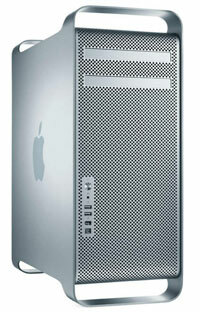 The shiny new Mac Pro features two Dual-Core Intel Xeon processors running up to 3.0 GHz, each sporting 4MB of shared L2 cache and independent 1.33 GHz front-side buses. Apple says that there’s “more than 4.9 million possible configurations” of the Mac Pro available (who works out this nonsense? ), with a new “direct attach storage solution” allowing snap in installation of up to four 500GB Serial ATA hard drives up to a total of 2TB of internal storage. The machine offers support for two optical drives to simultaneously read and/or write to CDs and DVDs with space for three full-length PCI Express expansion slots and one double-wide PCI Express graphics slot. On the front panel of the Mac Pro there’s a FireWire 800 port, a FireWire 400 port and two USB 2.0 ports, with extra FireWire 800, FireWire 400 and three USB 2.0 ports lurking on the back panel. Wrapping up the connectivity options, there’s also dual Gigabit Ethernet ports, optical digital input and output, analogue audio input and output, and optional built-in support for AirPort Extreme and Bluetooth 2.0+EDR. Graphics are taken care of with a NVIDIA GeForce 7300 GT with 256MB of video memory, with dual-display support. Users keen to take advantage of the zillions of configuration options, can upgrade to beefier ATI Radeon X1900 XT or NVIDIA Quadro FX 4500 cards that both come with 512MB of video memory. 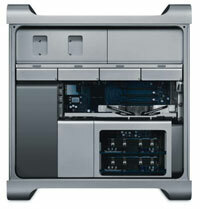 The standard configuration of the Mac Pro is shipping, priced at £1,699 (~$2,499, ~e2,522), without a monitor. Ships with Mighty Mouse and Apple Keyboard. During his annual speech yesterday, Apple CEO Steve Jobs briefly previewed the next version of Apple’s X operating system. He did, however, reveal some of the new features the operating system, which include a ‘Time Machine’ option that automatically backs up a Mac, enhanced videoconferencing options, improved Mail and the bundling of the Front Row and PhotoBooth programs. Seattle Plans Library WiFi Network – Conflict Ahead? Seven branches of the already-wireless central Seattle library are going WiFi. The announcement focuses on warnings that “no technical help is available” – but further South, in the San Francisco Bay area, the Joint Venture Silicon Valley organisation is planning to cover 1,500 square miles with 802.11 signals. What happens when such projects collide? According to Glenn Fleishman the Joint Venture group has yet to reveal any details – it hasn’t even officially announced anything on its own web site – but is organising a lobbying effort to local communities. 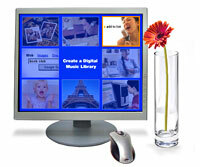 The group, headed by Intel, seems to be focusing on mobile, according to a local paper report, says Fleishman. That raises the real question of what the technical platform will be, because while Intel has done some work on mobile WiFi, it is spending a lot of effort planning for mobile WiMax – a confusingly similar technology, which has yet to be defined by the IEEE. Neither report, it seems, is talking of the inevitable spectrum conflict looming as domestic WiFi proliferates, and City WiFi spreads through the same areas. The issue is discussed by ABI Research’s senior analyst of wireless connectivity research, Philip Solis, who points out that the Qualcomm-Flarion merger has gone through, providing WiMAX with a possible competitor in 802.20. Solis has contributed to a recent paper from the company on the status of WiMAX, now that the WiMAX Forum has announced that some suppliers have put equipment for WiMAX certification for 802.16-2004, and passed. –The photos illustrating this article are fantastic shots taken by Timothy Swope at pixelmap – clearly a man with a strong eye, and it’s well worth looking at the rest of the shots. The building? 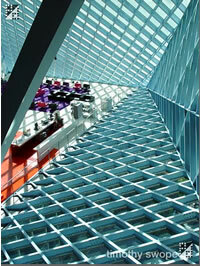 The stunning new Seattle library, designed by Rem Koolhaas. As we know, Apple has been claiming that the new Intel-based processor is 2-3 times faster than their current machines, due in no small part to Intel’s Core Duo processor. An enterprising clan has shot what they claim is a video of a boot-up shootout between an iMac G5 vs an Intel-based version. Taken at face value, the new machines do look considerably faster, but many are claiming that the video is a fix. Reading the comments, a number of people felt that the slow booting machine was faulty or had been violently shutdown, leading to the machine having to rebuild itself on startup. One thing is for sure. The Intel-based version boots faster than any Windows machine I’ve seen. For all Mac traditionalists, you’ll be pleased to hear that the new machines use the same boot up sound. Update: The new Intel-based Macs use Intel’s new boot technology – Extensible Firmware Interface (EFI). This has been designed to make machines startup as quickly as possible – a benefit that the Mac is showing, and so too will Windows Vista. Thanks to Seamus for pointing this out. Intel has been bigging up its next-generation laptop technology, claiming they will use 25 percent less power while retaining class-leading performance. Encouraged by a fast-growing laptop market, the boffins at Intel have been busily overhauling their popular Centrino technology, proudly unveiling ‘Napa’, a new Centrino featuring Intel’s new Yonah microprocessor – the first mobile chip to boast two cores. The chip is the result of the latest whiz bang technology which is capable of etching circuitry more than 100 times thinner than a strand of Bobby Charlton’s comb-over. “There are benefits to corporate users, there are benefits to consumers,” he added, probably before going on about the benefits to the birds and the bees too. Twin core machines are growing in popularity (we’ll be getting one shortly), with the technology letting users perform several tasks at the same time without the machine grinding to a halt. For example, one core could be busying itself by updating a complex spreadsheet, while the other core could be taking care of some heavy duty Photoshop work. The tough challenge for Intel’s engineers is shoehorning ever more powerful processors into ever-slimmer laptops while improving battery life and managing to dissipate the processor’s heat. In the last quarter, Intel scooped up an estimated $2.3 billion from sales of laptop processors, with laptop chip revenue providing a growing slice of Intel’s business. Sales accounted for a third for a third of total processor sales in the third quarter, up from around 27 percent a year earlier.